DropBox is an innovative file synchronization service that seamlessly keeps the assigned folder between computers in sync. You can even get to your files from anywehere via a browser interface. You can read my DropBox Review here. Dropbox was on closed beta so far and they have just launched publicly! You go ahead and sign for a free account (2GB space). There will be premium accounts with more space availabel shortly at the price of 50GB Dropbox for $9.99/monh or $99.99/year. Dropbox was previously available as a client for Windows & Mac. 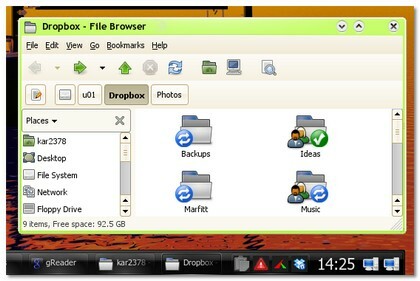 But, as they had promised earlier, now a DropBox client for Linux has been made available. Also, they have improved their interface to be iPhone-optimized. Dropbox for Linux is available right now for Fedora Core 9, Ubuntu 8.04 & Ubuntu 7.10. Even though only the above Linux flavors are listed, I was able to install the rpm file for Fedora Core 9 in my openSUSE 11.0 (x86) machine fine and get Dropbox running. Dropbox blog also reports that they have had reports of users running it on Gentoo, Arch Linux & Debiam distributions. Dropbox is currently in a closed beta (I had given out invitations here before.. comment if you’d like one. I have 13 left). But, after installing I noticed the linux client had a way to register for an account without an invite. It’s probably Dropbox team’s way of showing their love for Linux. Nice. If you are having trouble with it, try the Dropbox forums. Or try emailing linux@getdropbox.com. Congratulations Dropbox team for creating this awesome service. I love you guys! I totally recommend anyone to Try Dropbox Professional. You can even get a Portable Dropbox now! very interesting. i’m a big fan of these types of service, especially for backup purposes. and the 2 gb limit for free accounts should be more than enough for me, for now. just one more reason i finally switched over to dsl. kouji, this is one service I have been very impressed since they were in private beta. Madhur, I hope they introduce a smaller plan or increase the free space limit in the future. 2GB can fill up fast. Also, in the linux client I was able to change teh default location. Haven’t checked the windows client yet. Thanks K, that could be useful for sharing files with clients. But at the moment it looks like you can’t restrict access to the folders you’ve shared. I’d want to share a folder of latest documents with subscribed clients, but make it Read Only for the clients, but it doesn’t look like that’s possible yet? Dropbox is excellent and is now open (no more closed beta). Also, for the person asking about sharing docs with a select group Google Docs is good. I’ve been using Dropbox for quite sometime now and i must say that it’s one of the best site with regard to cloud computing. It’s really helpful especially if you’re outsourcing your work offshore. It’s really helpful especially if you’re outsourcing your work offshore. Thanks for the valuable information i have got through your post and it was really informative for me on the topic you discussed..I hope to read some more good articles from you..